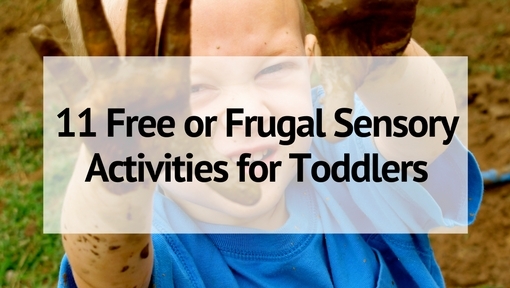 Sensory activities help your child learn about the world around them. 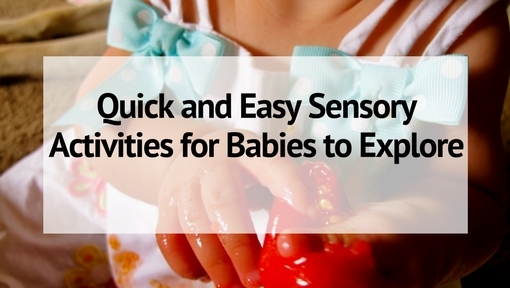 And you don’t have to wait until your baby gets older to start sensory play! 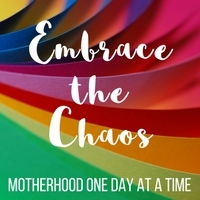 You can start as soon as your baby shows interest in grabbing, reaching and exploring the world around him. Sensory bags are a simple way to give your child sensory play and stimulation- without the mess or the risk of choking. 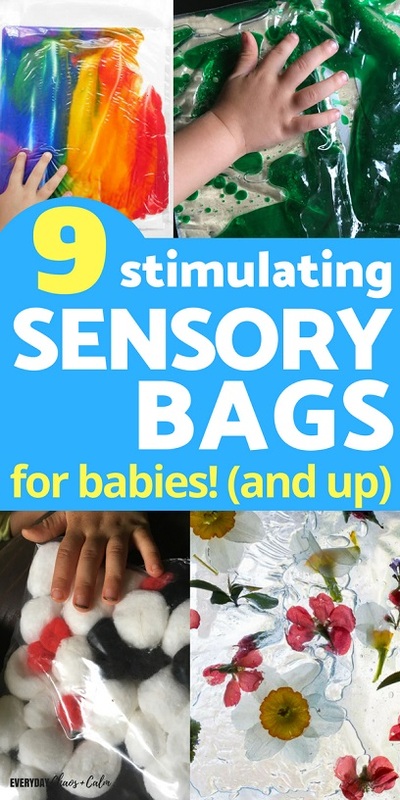 This sensory bag is perfect for even the youngest babies. It’s filled with high contrast, SOFT items, so they can safely explore the bag while they are having tummy time. And anything that helps make tummy time more fun, or even bearable, is great, right? I love, love, love this googly eye sensory bag. And I know it would be a hit for kids of all ages- even babies! 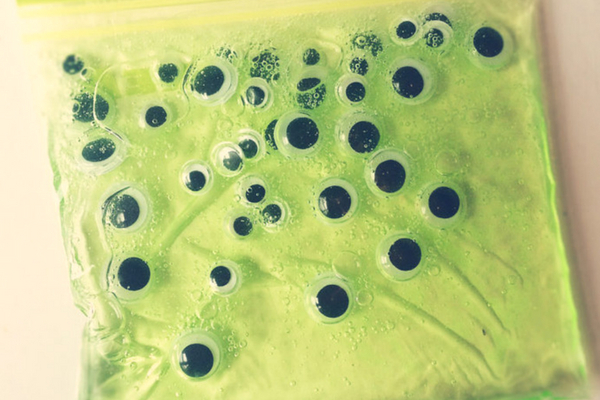 Learn how to make this Googly Eye Sensory Bag from Clare’s Little Tots. I remember painting with my kids when they were babies- boy was that messy! I love this way of painting without the mess. Babies can explore the colors, mix them, “paint” with them- but they can’t eat it or cover their bodies with it! 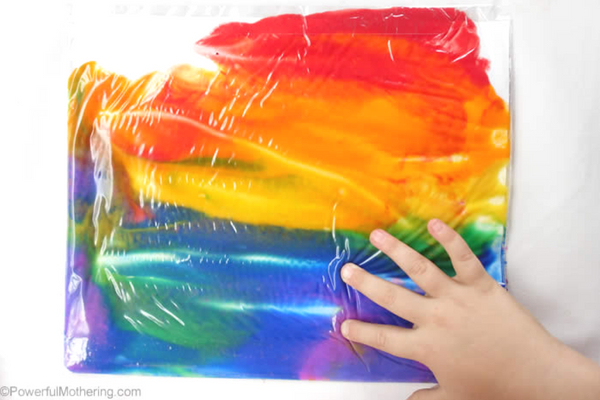 Get all the details on this Rainbow Paint Sensory Bag from Powerful Mothering. 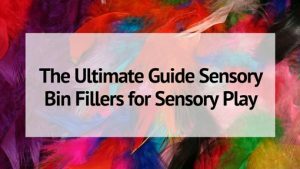 Similar to the rainbow painting, I love that this sensory bag allows babies to explore colors without the mess or the chances of them eating the paints. 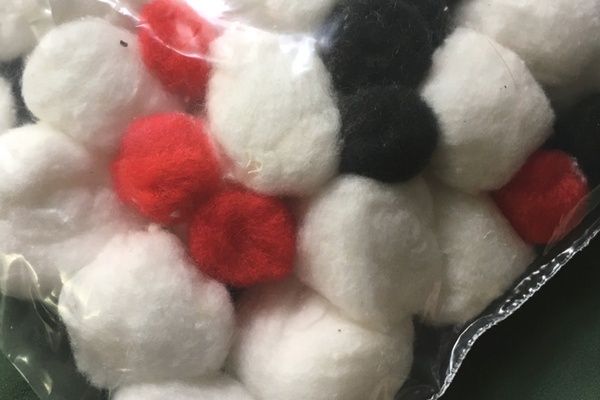 But this sensory bag has the added element of fluffy shaving cream which gives the bag more bulk and extra fun! 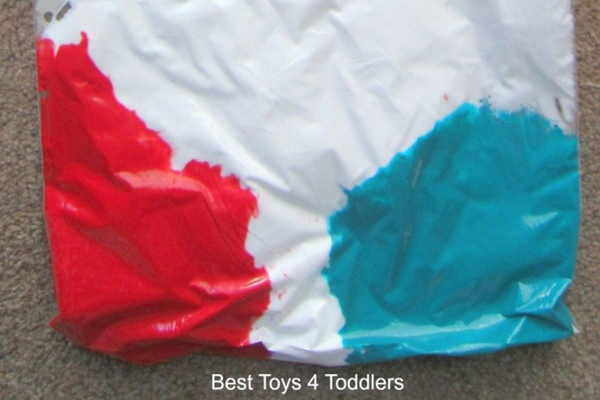 Get the full directions for this Shaving Cream Color Mixing Sensory Bag from Best Toys 4 Toddlers. 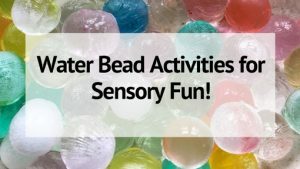 My kids LOVE water beads (read 8 Water Bead Activities for all the ways we use them with older kids). But they aren’t safe for babies or young toddlers. That’s what’s great about this water bead sensory bag- the water beads are all contained in the bag- no choking hazards in sight! 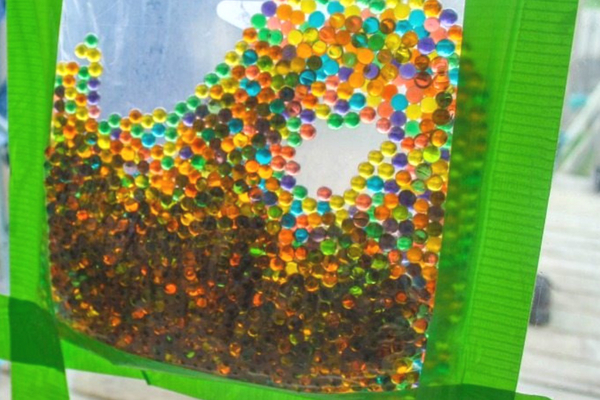 Check out how to create this fun Water Bead Sensory Window Bag from Parenting Chaos. 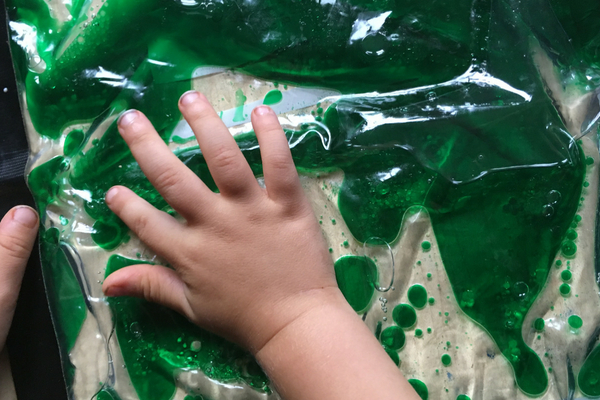 Oil and water is always fun to play with, and while babies won’t understand the science behind what they are playing with- they can still enjoy watching the water, oil, colors and bubbles that pop up with this oil and water sensory bag. 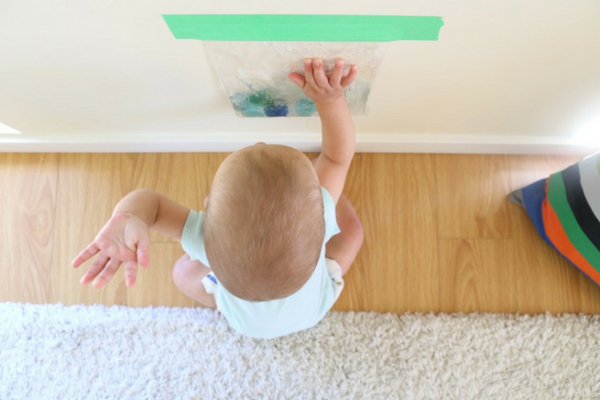 You can even hang it on the wall or window for babies who are able to sit up unassisted. 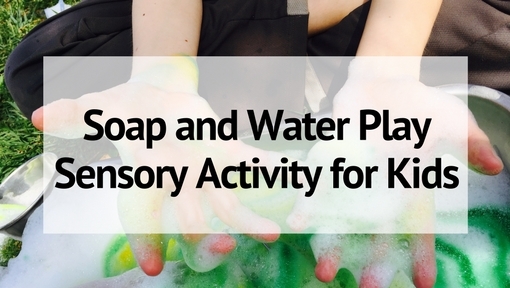 Learn how to make the Oil and Water Sensory Bag. 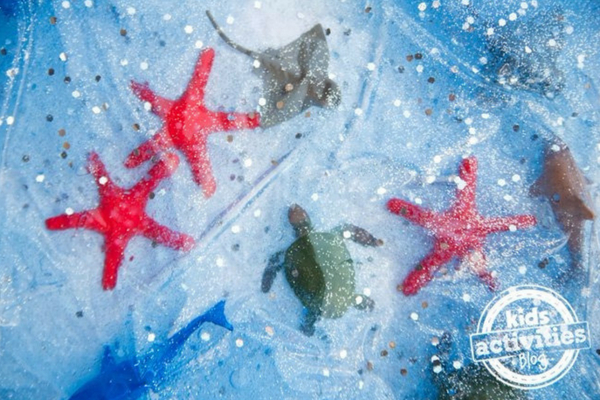 I love everything about this ocean sensory bag- the colors, the animals, the glitter! It looks like such a fun way to let babies and young kids explore the under water world in a safe, mess-free way! 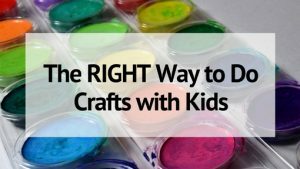 I love using things from nature for kid’a activities. And this fun sensory bag uses fresh from outside supplies for your baby to explore. 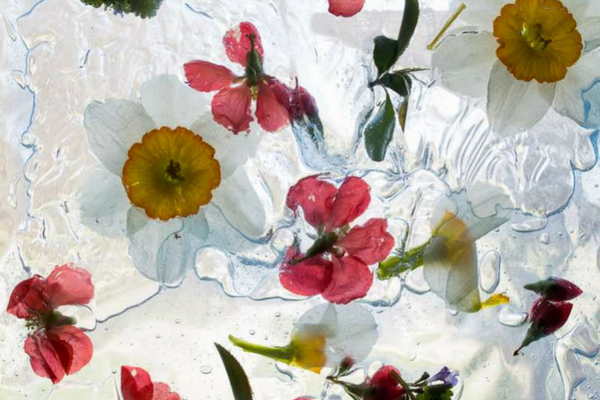 Flowers, leaves, grass, etc. 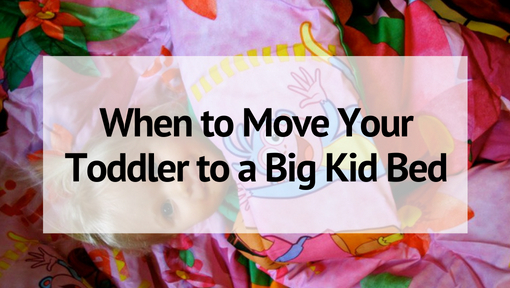 A great safe way for your child to explore the world she lives in. You can also check out my Flower Filled Nature Sensory Activity to try with your babies (and older) for some more hands on play. And just to show just how easy and simple sensory bags can be- this post about using sensory bags for sitting practice for your baby. She gives a couple examples of some super simple sensory bags to make- and the post is full of one adorable baby who loves his sensory bags! Click over to Mama.Papa.Bubba to see the full post.